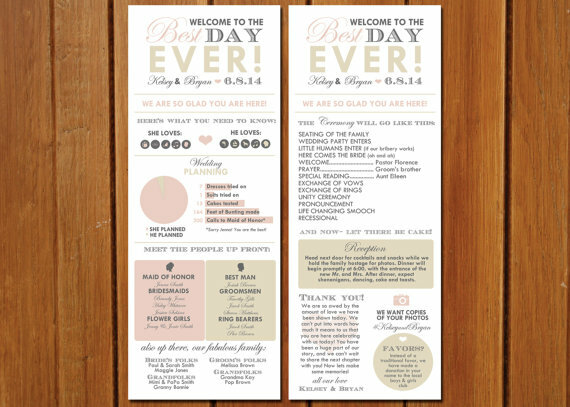 This unique program reads like an infographic, which gives your guests background information on you as a couple, the wedding planning process, and more. It also provides information on family, bridal party members, and the ceremony. I love this program has a modern feel to it… and I love the section dedicated to wedding planning. It gives a pie graph of how much he/she planned, along with a bar chart that shows how many dresses were tied on, how many feet of bunting was made, and how many calls were made to the MOH (Maid of Honor), among other things. Plus, you can totally customize this to suit your own style and your wedding! Love, love, love. Who needs a boring program when you can have one like this, 10x more awesome? It’s just another way we’re helping you to plan a more personal handcrafted wedding! Find out more about this program + grab yours here! P.S. In the meantime, why don’t you check out our current giveaways? Is there a template for this? Is there a template of this for purchase? I love this idea!!! do you have a template of this for purchase? Do you have a template for this? I love this program and would like to use this as a starting point to my program!